IDW Publishing returns to the post-human world with a new Zombies vs Robots series, coming in February. 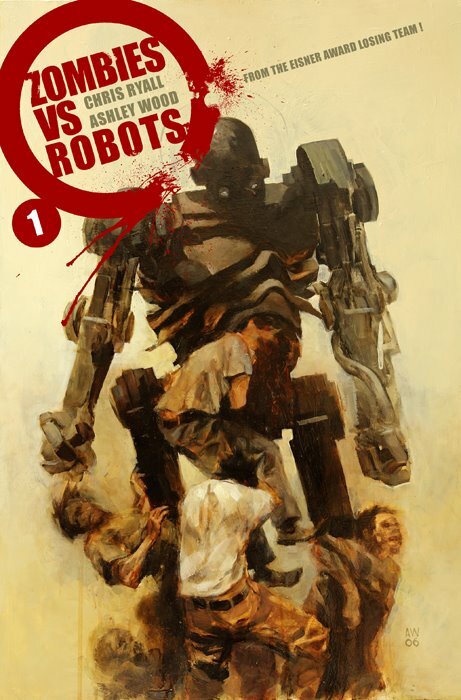 Zombies vs Robots Aventure is a continuation of the original series from the Eisner-losing team of Chris Ryall and Ashley Wood that explored a world in which a group of robots try to protect the final remaining human from a planet full of zombies. The new four-issue Zombies vs Robots Aventure will feature three serialized eight-page stories per issue, each one offering a different take on the war between these two forces. 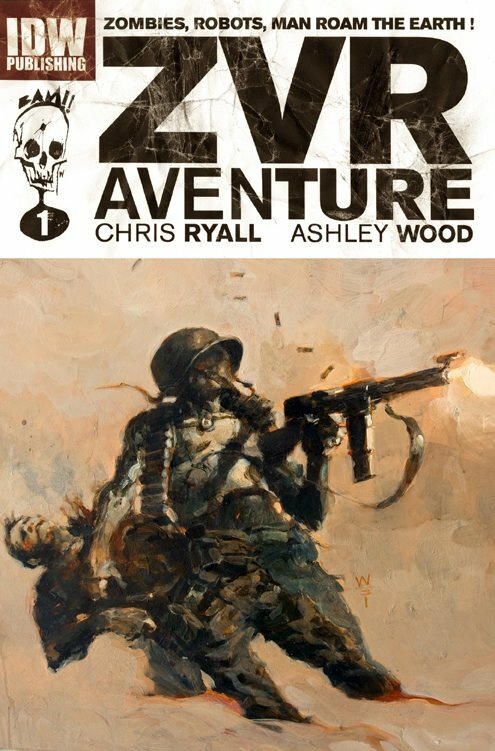 Ryall will pen each tale, continually developing the war between zombies and robots, and the role that human hubris played in the downfall of the world. The stories in Zombies vs Robots Aventure will feature new interior artists for the first time, with design and covers coming from co-creator Wood. * “Masques,” with art by Paul McCaffrey, follows up the earlier “origin” story of Zombies vs Robots and explores a non-combatant’s efforts to join the fight, with disastrous results. Issue #1 also features a different incentive cover by Wood, plus a bonus art gallery including pinups and sketches from all three interior artists. Zombies vs Robots Aventure #1 (of 4, $3.99, 32 pages) will be available in February 2010. Diamond order code DEC09 0922. Zombies Vs Robots (IDW, 2007) An Appreciation. Three scientists, Throckmorton, Winterbottom and Satterfield are the orchestrator’s of this titanic battle for Earth and the survival of Mankind. After creating a portal for time travel, a test of its capabilities brings one of the scientists back as a heap of flesh. Sentient robots are then designed and used to exploit time travel, as human bodies could not deal with its rigours (but the robots could). It is during these explorations through time (whether in the past or future is unclear) that the robots inadvertently bring back a zombie plague. Soon, and with the human race decimated, it is the sentient robots that are all that are standing between the future survival of mankind (which hinges on keeping a baby alive) and a seething mass of the undead. The robots are protecting the baby until such a time as they can clone the child, thus ensuring mankind’s continuation. 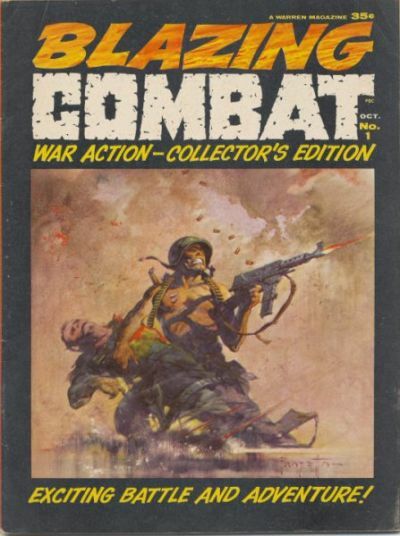 What you get is exactly what the title describes – Zombies versus Robots, in an epic and apocalyptic setting, the protection of the child paramount, the Robots calm and analytical against the mindless Zombie hunger and rage. The finale is literally apocalyptic, but with a twist at the end (there is a follow-up called Zombies vs Robots vs Amazons, which gives you an idea where the story is headed). Zombies vs Robots is all about broad strokes – robots fight zombies to protect mankind so in essence what you see is what you get – because I believe this title is all about the art. It has some of the most thrilling and intense artwork I have seen, and the design of the robots is amazing. I urge you to investigate this unique and effective sci-fi / horror tale. Due in June 2009. Looks like another one for my pull list.